The 2010 Haiti earthquake was a catastrophic magnitude 7.0 Mw earthquake. Its epicentre was near Léogâne, approximately 25 km (16 miles) west of Port-au-Prince, the capital of Haiti. The earthquake occurred at 16:53:10 local time (21:53:10 UTC) on Tuesday, 12 January 2010, at a depth of 13 km (8.1 miles). The United States Geological Survey recorded a series of at least 33 aftershocks, fourteen of them between magnitudes 5.0 and 5.9. The International Red Cross estimated that about three million people were affected by the quake, and the Haitian Interior Minister, Paul Antoine Bien-Aimé, anticipated on 15 January that between 100,000 and 200,000 would have died as a result of the disaster, exceeding earlier Red Cross estimates of 45,000–50,000. Haitian Prime Minister Jean-Max Bellerive announced on 18 January that over 70,000 bodies had been buried in mass graves. The earthquake caused major damage to Port-au-Prince and the surrounding area. Most major landmarks were significantly damaged or destroyed, including the Presidential Palace (President René Préval survived), the National Assembly building, the Port-au-Prince Cathedral, and the main jail. Compounding the tragedy, most hospitals in the area were destroyed. The United Nations (UN) reported that the headquarters of the United Nations Stabilization Mission in Haiti (MINUSTAH), located in the capital, had collapsed and that the Mission's Chief, Hédi Annabi, his deputy, Luiz Carlos da Costa, and the acting police commissioner were confirmed dead. Through the nights following the earthquake, many people in Haiti slept in the streets, on sidewalks, in their cars, or in makeshift shanty towns either because their houses had been destroyed, or they feared standing structures would not withstand aftershocks. According to reports, the earthquake struck in the most populated area of the country and estimates of the number of dead increased from 45,000 shortly after the earthquake to 200,000 six days later. The day after the earthquake the International Red Cross estimated that as many as 3 million people had been affected by the quake. Although we live far from them, actually we have experienced something like that in 2004 when Aceh were hardest-hit by a tsunami. The difference between Aceh's tsunami and Haiti's earthquake is the place of the concussion occur which is under the water and above the water respectively. The condition after the disaster is the same, destroyed and broken into pieces, all over the place. So, we should help them as much as we can. Although we cannot go to Haiti to help them, we still can ease the burden by giving them assistance in terms of financial, food or medicines. Now there are many non-governmental organizations and volunteers who provide facilities to help the earthquake victims in Haiti such as the Red Cross, the Global Medicine etc. We can make a donation through this organizations to help those victims. Imagine being born without arms. No arms to wrap around someone, no hands to experience touch, or to hold another hand with. Or what about being born without legs? Having no ability to dance, walk, run, or even stand on two feet. Now put both of those scenarios together no arms and no legs. What would you do? How would that affect your everyday life? Meet Nick Vujicic (pronounced Voy-a-chich) ... Born on December 4, 1982 in Melbourne, Australia, he came into the world with neither arms nor legs. Having had an uneventful pregnancy and no family history to expect this condition, imagine the shock his parents felt when they saw their first born, brand new baby boy, only to find he was what the world would consider imperfect and abnormal. 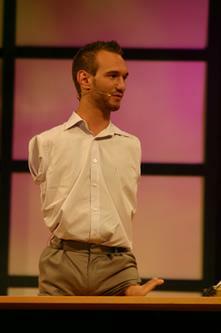 A limbless son was not what nurse Dushka Vujicic, and her husband Pastor Borris Vujicic had been expecting. How would their son live a normal happy life? What could he ever do or become when living with what the world see as such a massive disability? Did they or anyone know that this beautiful limbless baby would one day be someone who would inspire and motivate people from all walks of life, touching lives all over the world? Actually, Nick himself didn't know that he will succeed in his life one day. Being bullied at his school, Vujicic grew extremely depressed, and by the age of 8, he started contemplating suicide! Just then he realize that he should be thankful because God still give him a life, at least to live in this beautiful world. My first impression when I look at Nick Vujicic is the same as other people feel about him. I feel pity for him. I feel like crying. What can he do with a body like that? He can do nothing. He can just lie down and hope for the others to help him, care for him and feed him. But I was totally wrong because I have never imagined that he is a motivator that traveling all around the world to give inspiration to other people. He can walk, jump and even dance. Fantastic isn’t it? For me, someone should be really strong enough to live like that. It's true when people say it is easy to say rather than you experience something like that yourself. Like Nick himself, he once tried contemplating suicide because he can't bear to live like that. It is a nightmare for him but with a new spirit from his mother, he rise for the purpose of his living that is giving inspiration and motivation to others. I salute Nick for his never give up attitude. Nowadays, it is very difficult to find a guy like him. With a condition like that, people tend to sit on the walkway and ask for money or food from the others. But Nick is not like that. He use all the ability he has to help people realize their own ability and give them a new inspiration to live. that is really really cool! That is the only phrase that help him when he know that he wasn't the only one with major struggle in this world. When he was seventeen, he started to give talks at his prayer group, and eventually started his non-profit organization, Life Without Limbs. Today, Nick has build his own popularity among people all over the world especially student because of his motivational talk. He also have a new web site, Nick Vujicic's: Attitude is Altitude, that has a lot af interesting story about him since he started his career in motivating people. I think that's all I want to comment about Nick Vujicic and now I just can say, "Nick, you are AWESOME!!" Nick Vujicic is a great man. I really admire him. Cheah Meng Kit KEW080006 wrote: Nick Vujicic is a great man. I really admire him. me too.. that's why i choose him..